The church is designed to have people gather together around the Word and Sacraments, and to give everyone easy access to participate in worship together. Seating is comfortable. The church is networked, and we rely entirely on data projection during worship. 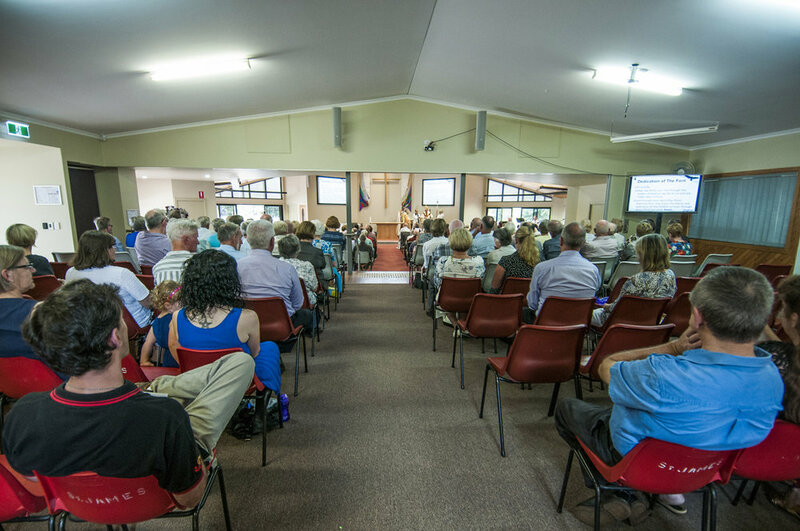 Our worship space holds 170 people, but it is connected to the community hall and, for larger services and events, the doors between the church and hall can be opened to accommodate about 250 people. When an Anglican church was established in Highfields in 1991, the people chose to dedicate it to St Anne. This dedication was renewed for the new church building in 2016. Although the worship space is open plan, the left side of the church building is dedicated as the New Guinea Martyrs Chapel. This is used for smaller and more intimate mid-week services. who were the new guinea martyrs, and what do they have to do with highfields? For parents with babies and very young children, there is a Parents Room inside the church itself, on the right hand side. It is available for your use, and is fitted with one way glass and linked to the sound system. This gives you complete privacy for breastfeeding and changing - but you can still see and listen to the service at the same time. The Parents Room has a change table and its own toilet. Feel free to use it - it's there for your convenience! The hall is used for Sunday School, small groups, meetings and social events. It's also used for morning tea after Sunday services. The doors between the hall and the church are opened for larger services and events, so that they can become one space seating about 250. The hall is especially designed as a community facility, and is available to community groups for inexpensive hire. It has a kitchen for the use of hirers, toilets and a waiting room. There are 100 plastic seats and a number of folding tables available for hirers' use, but they are normally stacked to allow free use of the floor space. As we don't have a license to serve alcohol, it generally isn't possible to hire the community hall for parties and wedding receptions - although the church may be available for the wedding itself! The church grounds (to the east of the community hall) amount to around 3,000 square metres, and are used for the quarterly Market and Car Boot Sale and for youth group activities. The grounds are also available for hire, and are suitable for fitness groups and exercise classes.